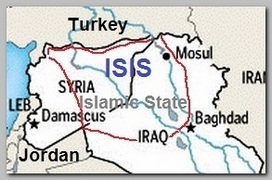 On 06/29/2014, Abu Bakr al-Baghdadi announced the establishment of a caliphate and himself as its caliph, to be known as Caliph Ibrahim, and the Islamic State of Iraq and the Levant was renamed the Islamic State – IS and is supposed to replace the”Colonial” Sykes-Picot agreement 0f 1916 between UK and France that shaped the borders of the Middle East. In an audio-taped message, al-Baghdadi announced that I.S would march on Rome in its quest to establish an Islamic State from the Middle East across Europe, saying that he would conquer both Rome and Spain in this endeavor. He also urged Muslims across the world to emigrate to the new Islamic State. On 07/05/2014, a video was released apparently showing al-Baghdadi making a speech at the Great Mosque of al-Nuri in Mosul, northern Iraq. Since 10/2011 a reward is offered by U.S. government, which lists him as Abu Du’a: up to $10 million for information leading to his location. * Following the distribution of a video footage through youtube website, on 08/19/2014, showing the beheading of the American journalist James Foley (1), who went missing in Aleppo, Syria two years earlier, in 11/2012, and the beheading of a second American journalist, the American jew with a Israeli citizenship Steven Sotloff (2), who went missing in Syria in 08/2012, on 09/02/2014, USA formed an international coalition of European and Arab countries to fight I.S.I.S and declared war on the group and all its allies (see – U.S 2014 Strategy ). Following the first American airstrikes, the prime rival of the Islamic State in Syria, Jabhat al-Nusra. allied itself to the Islamic State along with other Islamic groups to form an Islamic integrate front against the Western coalition. The Islamic State in Iraq and Syria – ISIS reportedly, on 08/21/2014, called for the release of a female Pakistani scientist Aafia Siddiqui in exchange for James Foley.According to the New York Times, ISIS sent through a “laundry list” of demands to the USA which included the release of Dr Aafia Siddiqui. ** A third video footage of the beheading of David Haines , a British aid worker kidnapped in Syria in early 2013, was published through Youtube, on the web, on 09/13/2014 (see also – Mehdi Nemmouch ). The Pakistani Taliban, Tehrik-e-Taleban – TTP, has declared, on 10/05/2014, its support to the Islamic State of Iraq and Syria (ISiS) radical group and ordered its fighters across the region to help the Middle Eastern extremists, TTP spokesman Shahidullah Shahid said in a statement that was issued to mark the Muslim holy festival of Eid al-Adha. The statement, which was released in Urdu, Pashto and Arabic, was released after ISiS fighters beheaded British aid worker Alan Henning. The executioner was, eventually, identified on 02/26/2015, as Mohammed Emwazi .